While a temple has been standing at this location since the mid-1600’s, the current Fukusai-ji Temple is built of more modern materials yet its giant Bodhisattva and turtle-shaped architecture harkens back to ancient mythology. Since 1628 the Fukusai-ji Temple has stood in Nagasaki, Japan, although not always in its current incarnation. The old temple was unfortunately completely obliterated when the atomic bomb was dropped on the city in 1945, but it was not long (relatively) before a new temple was built on the site in 1976. It is this iconic new temple that stands today. 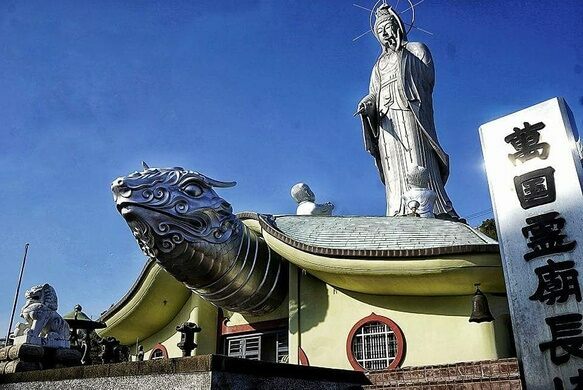 From the outside, the most striking features include a massive 60-foot statue of Kannon, the Bodhisattva of Compassion, and the building itself on which Kannon stands which is shaped like a giant turtle. Both the Kannon figure and the giant tortoise head poking out above the door are made of shining aluminium giving the site a thoroughly modern look despite its history. The interior of the temple has also been changed. In addition to its purpose as a zen temple, it is also a memorial and burial site for the remains of over 16,000 casualties of World War II. Swinging above the remains is one of the largest Foucault’s Pendulums in the world, hanging all the way down from the interior of the Kannon figure and spinning its weighted end. Not even an atomic bomb could stop the Fukusai-ji Temple, and in if anything seems to have only made it stronger and more interesting.